I previously blogged about this here. Since I don’t always have access to a pristine 9.1 instance, and I’m terribly forgetful where I put stuff, I thought it would be helpful to detail the ClusterSetupTemplate.CSV further. - Network Details 2 - Cluster and Node Mgmt. 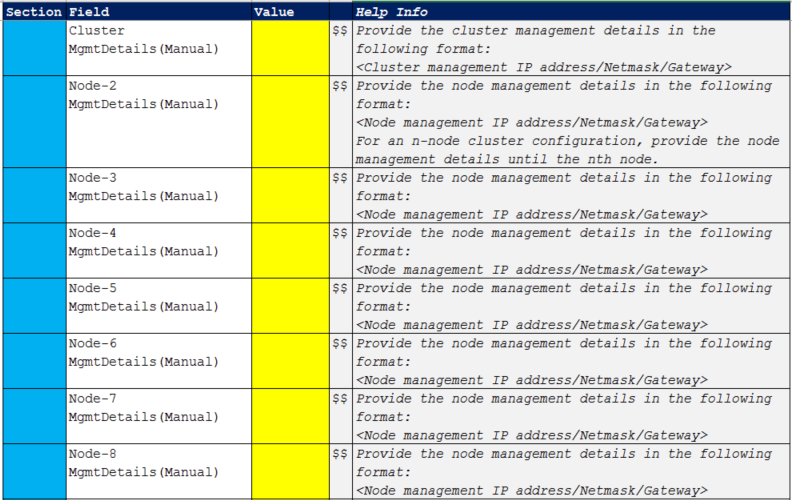 Image: Network Details 2 - Cluster and Node Mgmt. ,Configuration Type(for SingleNodeCluster),,$$,"To create a single-node cluster, type True. If you type “True”, all the cluster LIFs will be deleted and all the ports in the cluster IP space will be moved to data. To create a single-node cluster without deleting the cluster LIFs, type False. This is applicable only when a single node is discovered." ,Configuration Type(for TwoNodeCluster),,$$,"Type switched/switchless based on your cluster configuration type. Supported only for a two-node cluster. 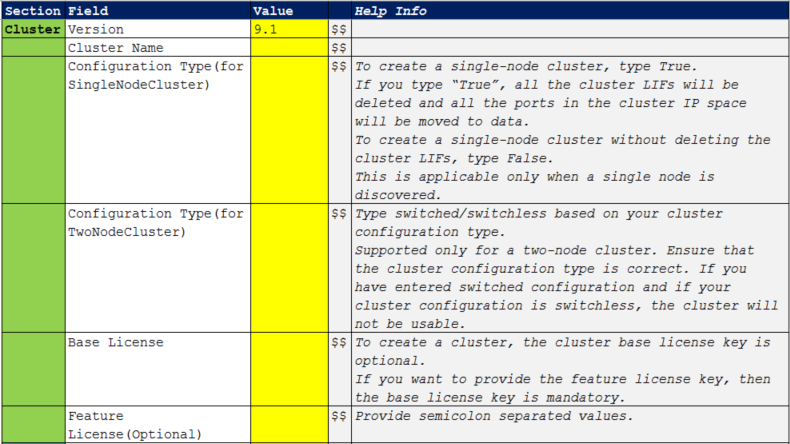 Ensure that the cluster configuration type is correct. If you have entered switched configuration and if your cluster configuration is switchless, the cluster will not be usable." ,Base License,,$$,"To create a cluster, the cluster base license key is optional. If you want to provide the feature license key, then the base license key is mandatory. " ,Feature License(Optional),,$$,Provide semicolon separated values. 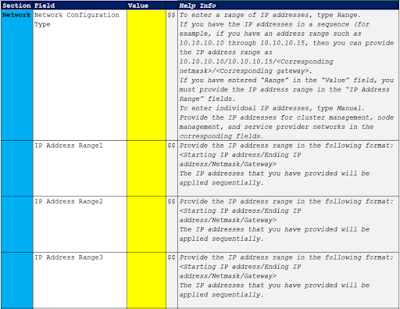 Network,Network Configuration Type,,$$,"To enter a range of IP addresses, type Range. If you have the IP addresses in a sequence (for example, if you have an address range such as 10.10.10.10 through 10.10.10.15, then you can provide the IP address range as 10.10.10.10/10.10.10.15//. 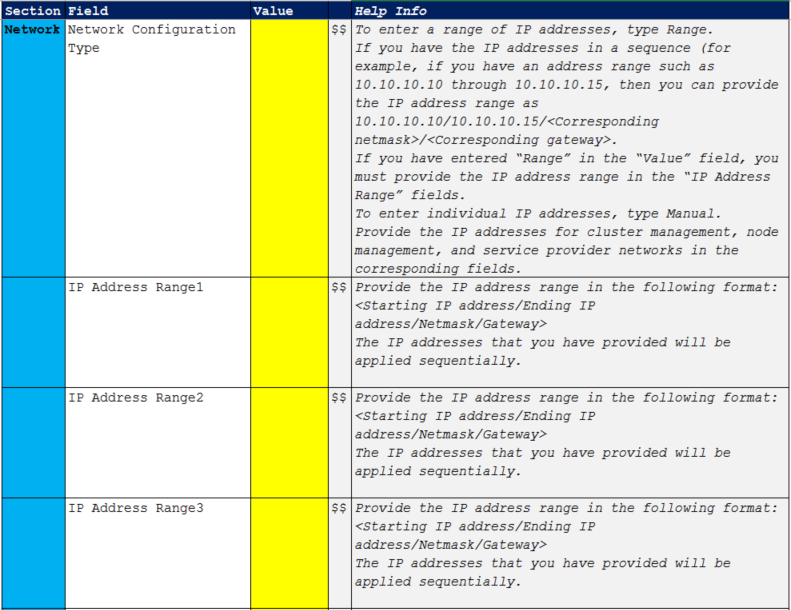 If you have entered “Range” in the “Value” field, you must provide the IP address range in the “IP Address Range” fields. To enter individual IP addresses, type Manual. Provide the IP addresses for cluster management, node management, and service provider networks in the corresponding fields." The IP addresses that you have provided will be applied sequentially." 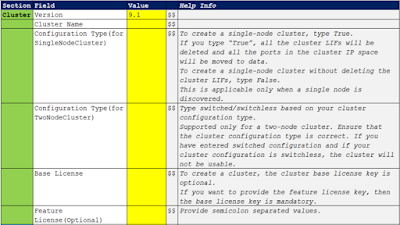 For an n-node cluster configuration, provide the node management details until the nth node." 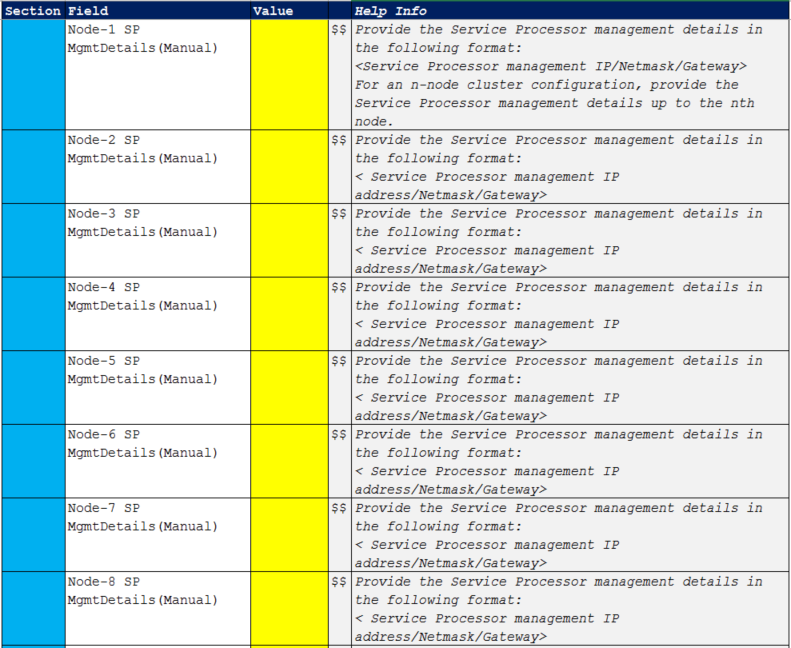 ,Override Existing SP MgmtDetails,,$$,"To override the existing Service Processor configuration, type True. To retain the existing Service Processor configuration, type False. 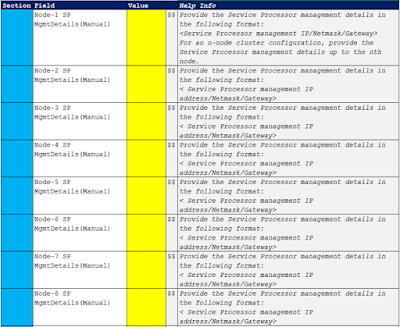 If you have entered ""Manual"" in the ""Network Configuration Type"" list and you want to override existing Service Processor configurations, provide the Service Processor management details in the following rows. If you have entered ""Range"" in the ""Network Configuration Type"" list and you want to override existing Service Processor configurations, the IP address range that you have provided will be applied sequentially for Service Processor management. " 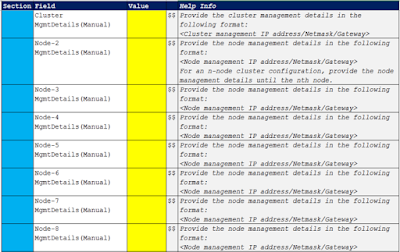 For an n-node cluster configuration, provide the Service Processor management details up to the nth node. " < Service Processor management IP address/Netmask/Gateway>"
,DNS Domain Names,,$$,"Provide semicolon separated DNS domain names. You can provide up to six domain names." ,DNS Server IP Addresses,,$$,"Provide semicolon separated DNS server IP addresses. Only IPv4 addresses are supported. You can provide up to three DNS server IP addresses." ,NTP Primary,,$$,Provide primary NTP server details. ,NTP Alternative(Optional),,$$,Provide alternative NTP server details. Support,AutoSupport Status,,$$,"To enable AutoSupport on all the nodes, type True. To disable AutoSupport on all the nodes, type False." ,EMS Mail IDs,,$$,Provide semicolon separated email IDs. ,SysBackup Transport Protocol,,$$,"Provide an appropriate transfer protocol for system backup (FTP or HTTP). System backup is applicable only for single-node clusters." ,SysBackup Destination Address,,$$,"Provide a destination address for system backup.